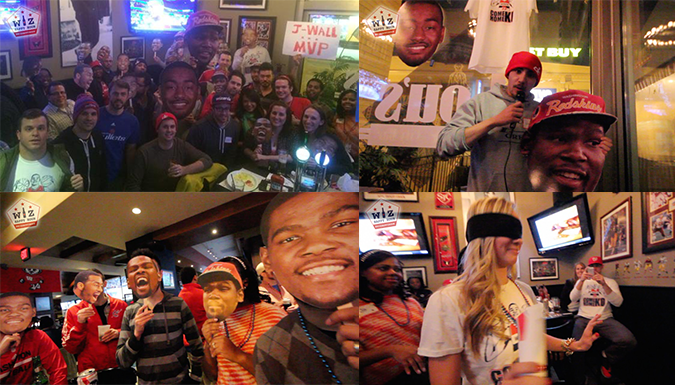 If you missed the last KD 2 DC Wiz Happy Hour event you missed a lot of fun. While we were 100% rooting for the Wizards, we had fun joking about the Kevin Durant to DC movement and listening to what fans had to say about the matter (Read about it in the Washington Post). The event was such a success and the fans really enjoyed it so we are doing it all over again! This time things are getting a little more real as Durant will be playing at the Verizon Center against the Wizards. Fans now have an opportunity in person to cheer for Durant or what not. We are going to need all Wizards fans to come out, pro-Durant, anti-Durant or indifferent and show the area how much we care about our home town Wizards and amp it up for the tv cameras! (The Durant stuff is a fun sidenote). Here's what to expect if you come to Penn Commons on Wednesday. First off is the happy hour. For Wizards fans only (must RSVP here for a wristband) Penn Commons famous $5 40 beer happy hour is extended to 8pm when the game begins. This extra hour of happy hour is crucial and amazing, one of the best post 7pm deals in Chinatown. Next is all the schtick! We will have a bunch of Kevin Durant masks that you are welcome to take into the game. Use it to troll him or recruit him, or just to have a lot of fun. (We will also have all of our Wizards masks as well). We will also re-open the KD2DC Confessional (see video above) so you can make your case for KD to come, or stay in OK City! @WizHappyHour I want to come to this. What do I need to do? This is going to be a great time before the game and tons of fun. Plus being on TV and repping the Wizards with chants and Wiz gear and Wizards masks is going to help show everyone around the city how we do it in DC! Remember to RSVP above and we'll see you Wednesday night!